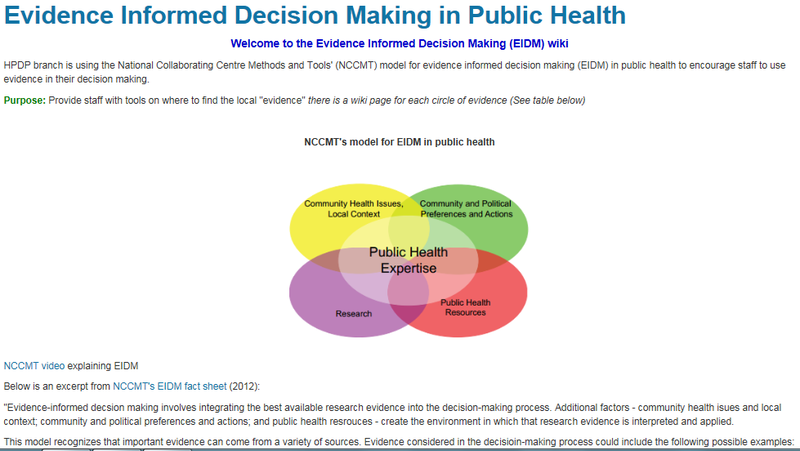 This issue was published in 2017 and includes nine stories from Canadian public health professionals that demonstrate the use of evidence-informed decision making (EIDM) in a wide range of public health activities, either using evidence to inform a program or intervention, or building capacity for EIDM. The stories describe the initiatives, implementation, evaluation, and lessons learned from using evidence in practice, or building capacity for EIDM. Click here to download a PDF version of Issue 1. Click here to access slides and recordings from presentations in the NCCMT’s Peer-to-peer webinar series, featuring authors of stories from the first issue of the EIDM Casebook. Faced with an apparent health inequity, this team advocated for change in policy that made the HPV vaccine available in the Catholic school jurisdiction. Read more about how evidence was used to successfully influence change of a school board’s policy. To help improve the capacity of individuals and the health unit as a whole, this interdisciplinary team helped champion the use of evidence and foster an environment of learning at their health unit. Read more about how a Community of Practice was developed in a large public health unit. Facilitating knowledge exchange of research evidence across a large organization can be a challenge! Read more about how a program planning management officer at the Ottawa Public Health unit developed a centralized platform to simplify knowledge sharing and encourage evidence use across the unit. 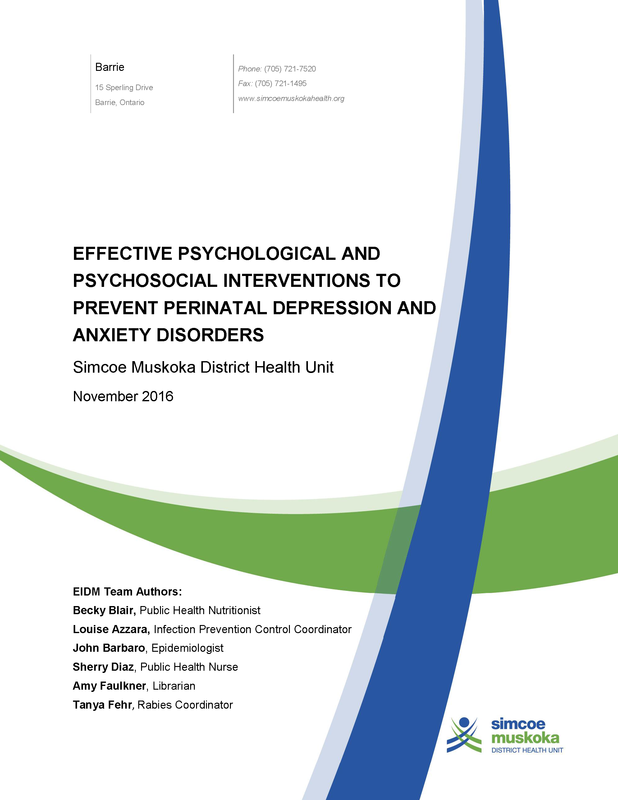 A higher-than-provincial-average rate of mental health concerns during pregnancy in the SMDHU catchment area prompted a review of the evidence for interventions to prevent perinatal mood disorders. Read more about how this team synthesized available evidence and shared it with decision makers. Recognizing the importance of involving staff in all roles within the organization, SDHU developed a comprehensive strategy to integrate evidence into all staff’s operations. Read more about how this health unit built evidence into the routines of all staff members. After Hepatitis C care was integrated within primary care settings, there was a lack of resources tailored to primary care nurses caring for Hep C patients. Read more about a best practice resource tool that was developed to fill a resource gap. Situational assessments are a valuable source of evidence but are most effective when processes are clear and consistent. Read more about how these authors improved the consistency and rigour of situational assessments at their health unit. Addressing the global issue of antibiotic overuse at a local level, a team at Public Health Ontario developed a knowledge translation strategy to reduce the prescription of antibiotics for asymptomatic bacteriuria in long-term care homes. Read more about how this strategy was designed to change behaviour. 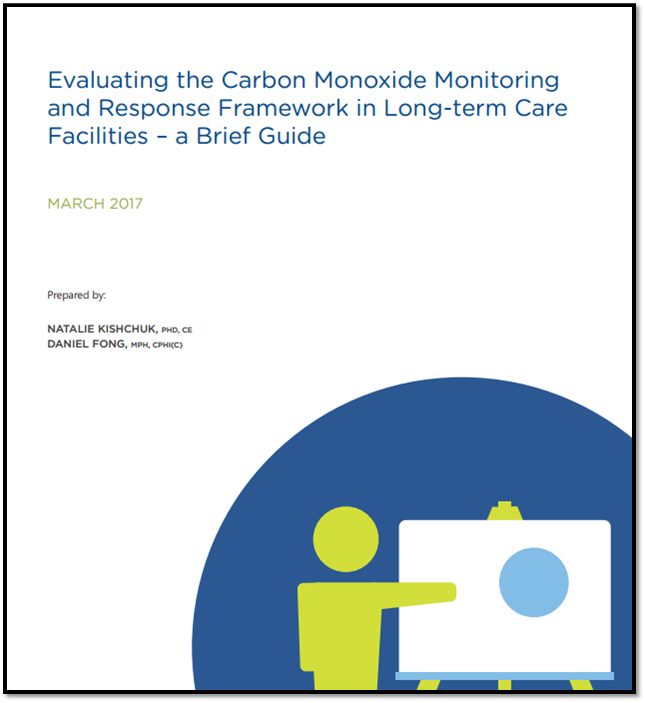 In order to protect vulnerable populations in long-term care facilities from the risk of carbon monoxide (CO) exposure, this group piloted a program to establish a CO monitoring and response framework. Read more about the implementation, evaluation and impact of this initiative. Human papillomavirus (HPV) is the most common sexually transmitted disease in Canada and the world.1 Immunization can prevent HPV-related cervical cancer, particularly if administered prior to initiation of sexual activity.2 HPV immunization has been available to schools in Alberta free of charge and administered through the public health system since 2008. However, HPV immunization rates in school-aged girls have varied considerably across the province depending on the immunization delivery model. In Edmonton, where immunization took place in both public and Catholic schools, the rates of immunization were much higher than in Calgary, where the Catholic school jurisdiction did not allow HPV vaccine delivery in schools requiring community clinic delivery. Reducing inequity in access is a key goal of public health services. Public health officials suspected there was a potential inequity created with the differential immunization delivery approaches. Our public health research department examined the available data to identify if there was inequity in vaccination access. The first objective for this project was to identify if there was inequity in access to HPV immunization due to social conditions. If inequity was identified, the second objective was to use the data to change school district policy to allow HPV immunization in all schools. This project used a knowledge translation strategy that included both data analysis and dissemination to key stakeholders to reduce health inequity by changing school jurisdiction policy. The core of this strategy was to use local data to influence policy through decision-makers. The dissemination approach focused on engagement with and spread of evidence to a variety of individuals and groups. Social justice principles were intentionally used to frame the message to appeal to Catholic values of fairness and equity for those less able to meet health needs due to social and economic circumstances. The scope was confined to a single school jurisdiction with 109 schools located in the city of Calgary. Since the school district was heavily influenced by its religious leaders, the bishop was a major target for dissemination. No additional resources were required to implement the strategy. Our public health research department planned and implemented the data analysis. We used local immunization data including immunization status, school district, student postal code, grade and age. We linked the data through postal codes to the material deprivation index,3 providing a neighbourhood deprivation score for each student. Using multivariable logistic regression, we demonstrated that girls in schools without access to the in-school delivery model were significantly less likely to be immunized if they lived in the most deprived neighbourhoods. Conversely, girls living in lower socioeconomic status neighbourhoods attending public schools with in-school delivery were more likely to be immunized than those of higher socioeconomic status.4 Other potential influencing factors were taken into consideration, but the limitations from using administrative data and neighbourhood rather than individual socioeconomic status may have influenced the accuracy of the results. The dissemination of the results was done in stages. Advocacy of equitable access to HPV immunization by a national group led by a University of Calgary ethicist and by a group of retired school superintendents influenced the dissemination. Sharing the study results combined with information on the risk of cervical cancer and the effectiveness of the HPV vaccine started with individuals and then spread to groups, including the advocacy groups. Engagement with and personal influence from a respected authority was the cornerstone of the strategy. Spread was accomplished by incorporating a grassroots component of sharing the findings with colleagues within public health who were free to use them in their own jurisdictions and with school councils as described below. "Targeting both decision-makers and parents who can also influence policy-makers was an important tactic that included presenting information specifically tailored to the audience." The iterative process of the dissemination strategy allowed for adjustments in how data were presented and to whom. Our first reporting used odds ratios and a graphic of stick people to demonstrate the increased odds of not being immunized. In the end, for our more lay audience, we used simple bar graphs to demonstrate differences in vaccine uptake. For the publication we used profile plots based on the regression models that incorporated covariates to increase the scientific rigour of the study results. We planned to judge the success of the strategy by whether or not we achieved our objective to change policy while maintaining positive relationships and engagement with religious and jurisdiction officials and parents. On reflection, we were one of many actors in the milieu and roles and alliances were not always clear. Tensions were created based on perceived conflicting value propositions and at times emotionally-charged rhetoric between opposing views. The knowledge translation strategy was successful and the policy was changed in 2012; there is now in-school immunization in both public and Catholic Calgary school jurisdictions. Despite the bishop’s reticence, the study results were received positively by the new superintendent and parent councils. Their positive response undoubtedly influenced the policy change. The coordinated university-led lobby that was occurring simultaneously with our equity-focused dissemination strategy undeniably also influenced the resulting favourable policy change. The power of the clinician–researcher partnership was integral from inception to completion. Targeting both decision-makers and parents who can also influence policy-makers was an important tactic that included presenting information specifically tailored to the audience. It was fortuitous to conduct the data analysis at the same time as the establishment of a new superintendent and the immunization lobby. The number of stakeholders (superintendent, trustees, parents and the two prominent lobby groups) and lack of role clarity were some of the challenges in implementing and sustaining the process, and required the use of negotiating tactics. Staying on message was important in maintaining integrity and engagement. 3Pampalon, R., Hamel, D., Gamache, P. & Raymond, G. (2009). 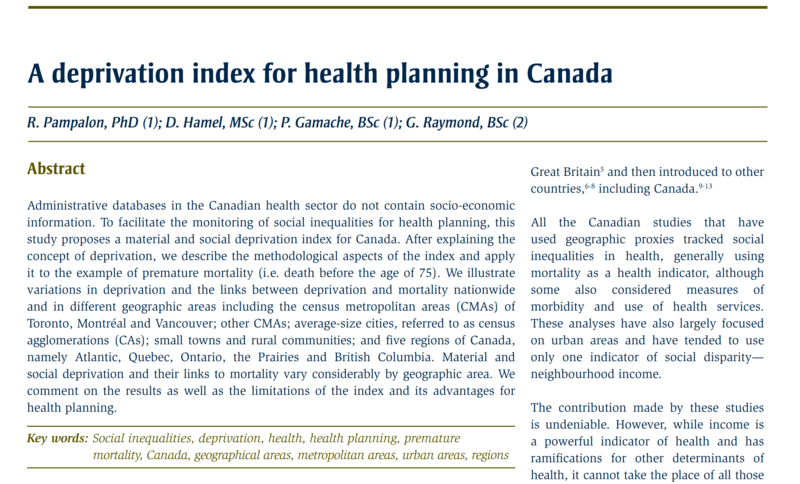 A deprivation index for health planning in Canada. Chronic Diseases in Canada, 29. 4Musto, R., Siever, J.E., Johnston, J.C., Seidel, J., Rose, M.S. & McNeil, D.A. (2013). Social equity in Human Papillomavirus vaccination: a natural experiment in Calgary Canada. BMC Public Health, 13. 5 Hjalte, L. (2012, June 25). Dr. Susan Bornemisza, lawyer Juliet Guichon and Dr. Ian Mitchell urge Calgary Catholic school trustees to allow in-school HPV vaccinations at a press conference in Calgary June 25, 2012. The Vancouver Sun. With the public health trend shifting toward a greater emphasis on employing EIDM principles, members of City of Hamilton’s Public Health Services (PHS) leadership team committed to supporting the related educational needs of staff. In 2015, senior leadership asked for interested staff from each division of public health to participate in a National Collaborating Centre for Methods and Tools (NCCMT) Knowledge Broker Mentoring Program. The program was intended to support PHS in developing capacity for EIDM by assessing organizational readiness for EIDM practice and building competence of selected staff. Designated staff would represent each division and act as internal knowledge brokers (i.e., EIDM experts) to advance the uptake and use of research evidence in practice. Develop participant capacity to appraise relevant public health research evidence through regular review of that evidence with peers. Develop staff capacity to apply all the steps within the EIDM framework to public health practice through discussion, case examples and the use of validated EIDM tools. Support program teams in their efforts to appraise research evidence and use the EIDM framework through peer-to-peer consultation. The knowledge broker facilitated the initial CoP meetings and then other members took on the facilitation role on a rotating basis. Membership was open to all interested public health staff, managers and students. Participation and attendance at meetings were voluntary. A total of 9 or 10 one-hour meetings were held per year. To support buy-in and recruit new CoP participants, the knowledge brokers delivered presentations and met with management teams. The intent was to promote the goals of the CoP and describe how staff involvement could impact public health practice. Two events for staff were dedicated to introducing the EIDM framework and sharing staff success stories about how EIDM was applied to their work. Between March 2015 and March 2017, the CoP met monthly with an external mentor from NCCMT to review literature relevant to their work and discuss implications for their practice. 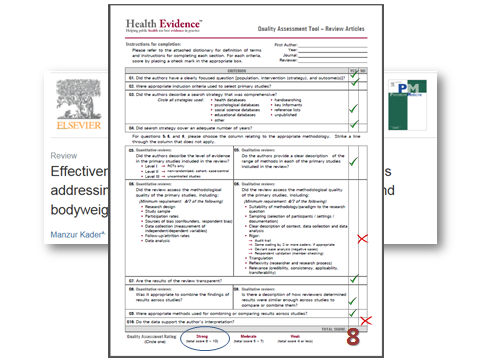 Relevant appraisal tools (e.g., Health Evidence Quality Assessment tool for systematic reviews and Critical Appraisal Skills Programme tools for single studies) were used to review 22 research articles. The Applicability and Transferability of Evidence tool was used to determine whether and how to apply the research evidence to local public health decision making and policy making. Several barriers were encountered during the implementation of this initiative, such as competing demands, resistance to changing usual practice and lack of common understanding about EIDM and its implications for practice. Most of the barriers were overcome by communication strategies, both formal (e.g., presentations and newsletters) and informal (e.g., emails, face-to-face discussions, peer-to-peer recruitment). These strategies helped build a common understanding of EIDM, let people know how they could get involved with the CoP and shared how peers used it to enhance their practice. Establishment of an inclusive, flexible and welcoming environment for staff with varied skill levels was key to overcoming most barriers. Prioritizing the time it takes to participate continues to be one of the main barriers for staff. However, this barrier is reduced by the management team’s endorsement of staff participation, frequent reminders and flexibility in meeting times. No formal evaluation was conducted. Success of the development and implementation of the EIDM process was measured by participation rates, positive feedback and increased incorporation of learning into practice. The CoP has grown to include over 19 interdisciplinary staff and managers who participate regularly. Informal feedback by participants indicates that the CoP has helped to increase staff confidence in making evidence-informed decisions while taking into consideration available resources and the local context. Lessons learned through this initiative were that an EIDM CoP works best if meetings are supported by management, informal, inclusive, driven by real work examples, framed as professional development and conducted during work time. In the beginning, it was important to have strong knowledgeable leadership to support all levels of proficiency, consistent communication related to the meetings and an open process for choosing articles to review. Ongoing informal evaluation was also important to ensure the program was meeting participant needs. This was accomplished through a quick check-in with participants at the end of each session. Secure management support at the outset. Encourage volunteer over mandated participation. Determine participant needs to drive the focus and goals for the CoP. Establish and adapt a Terms of Reference to continually meet participant needs. Empower staff to take turns leading the meetings. Encourage knowledge transfer to non-participants where relevant. For example, members looked at evidence on how to reach parents to encourage them to pack a healthy lunch and then shared the successful approaches with school public health nurses. Competency in EIDM will ensure that public health professionals develop prompt and effective decisions in response to community need. It is critical that staff be supported to develop their capacity to consistently apply EIDM principles. This initiative is an example of what can be accomplished in a cost-effective manner to engage staff to use EIDM in their practice. 1Public Health Agency of Canada. (2008). Core competencies for public health: release 1.0. Ottawa, ON: Her Majesty the Queen in Right of Canada, represented by the Minister of Health. 2Peirson, L., Ciliska, D., Dobbins, M. & Mowat, D. (2012). Building capacity for evidence-informed decision making in public health: a case study of organizational change. BMC Public Health, 12, 137-149. Ottawa Public Health (OPH) consists of 500 staff divided into six different branches and 26 teams. Due to the number of staff and differences in staff roles and skill levels, it is a challenge to undertake and facilitate knowledge exchange, specifically knowledge exchange of research evidence. However, without knowledge exchange, there is a risk of duplicating work, perpetuating inconsistent approaches and isolating decision making on imperative health topics. This can have costly impacts on staff time, along with public health practice and policies. Although research questions may differ across teams, the research process could inform decision making and promote collaboration across the organization. Three key drivers emphasize the importance of evidence use at OPH. Firstly, at the local level, OPH is participating in the second cohort of the National Collaborating Centre for Methods and Tools (NCCMT) Knowledge Broker Program. This program seeks to develop organizational capacity for evidence-informed decision making (EIDM). Secondly, at the provincial level, the new Ontario Public Health Standards for 2018 reinforce the importance of “Effective Public Health Practice” as a foundational standard. Following the implementation of this standard, Ontario public health units will be encouraged to engage in more EIDM and knowledge exchange among colleagues and community partners. Lastly, at the federal level, understanding and implementing EIDM is an essential skill that is embedded throughout public health core competencies1 and is identified in competency 2: Assessment and Analysis. Build staff capacity to conduct literature reviews and to critically appraise literature. Share literature review findings to ensure consistency of practice and to facilitate knowledge exchange among teams. Facilitate knowledge exchange of research evidence. Use a centralized platform for staff to locate resources to conduct literature reviews. Streamline work processes to avoid duplication of research evidence work conducted at OPH. Facilitate collaboration through knowledge exchange of ongoing projects. Implement a consistent approach to conducting literature reviews. Increase staff confidence in gathering, appraising and integrating evidence from research in daily practice. Increase use and integration of data beyond research evidence such as community health issues and local context (e.g., public health resources, community and political preferences and actions). The wiki initiative consisted of three phases: content development, software selection and construction, and promotion and awareness building. To ensure consistency, content development was done in collaboration with our Shared Library Services Partnership (SLSP) librarian. Presently, our SLSP librarian is pivotal for staff when they are starting the EIDM process. Her role includes building staff capacity, such as teaching how to define research questions, searching for relevant articles and accessing up-to-date tools and resources. Templates to help staff synthesize information were also created with support from OPH staff. The second phase of the initiative consisted of building and selecting software. This was completed in-house with support from OPH Information Technology staff. The wiki platform was chosen for its accessibility and collaborative features, which allow staff to post their own literature reviews with limited training and/or instruction. The third phase focused on generating awareness of the wiki to all staff. This was an integral part of the initiative as the wiki requires staff participation to facilitate knowledge exchange. By posting literature reviews, staff members encourage colleagues to view the completed work, build upon topics explored and collaborate on ongoing projects. Communication activities were outlined to support this phase, including promotion of the wiki within team meetings and on a one-on-one basis. The initiative was led by the author and supported by the Health Promotion Disease Prevention branch manager. The initiative was piloted in the branch beginning in June 2016. Populating the wiki with a comprehensive list of completed literature reviews acted both as a facilitator as well as barrier to the initiative. Posting helped peak staff’s interest in their colleagues’ work; however, it also intimidated staff who were less familiar with the evidence-informed public health process and were concerned that they could not properly summarize their research within the wiki platform. To overcome this barrier, the author worked closely to support teams conducting literature reviews to post synthesized findings to the wiki. Assisting staff through this process helped build capacity, eased anxiety and promoted wiki technology. Working with staff on an individual level also exposed inconsistent processes in conducting literature reviews at OPH. Discussion regarding these differences provided an opportunity to share current best practices in conducting literature reviews, appraising literature and promoting a consistent standardized approach on the wiki. Table 1 lists activities that will be carried out to address some of the barriers identified. Continue promotion on a one-on-one basis. Continue promotion of the wiki at EIDM workshops and library-related training sessions at OPH. Provide ongoing workshops for OPH nursing students through collaboration with the SLSP librarian (OPH accepts approximately 120 nursing students per year) on how to conduct literature reviews and post findings to the wiki. Ask for advice on how to promote usage from other City of Ottawa departments that extensively use wikis. Highlight advantages of the wiki as a communication platform to management, including objectives and needs. Employ the wiki as a vehicle to deliver information from the OPH knowledge broker team. Provide ongoing one-on-one support for staff in using research evidence. Conduct ongoing formal and informal interviews with staff to gather recommendations and feedback. Provide evaluation and continuous improvement of the product as needed. Informal interviews with a small number of staff members indicated the wiki has increased staff interest and awareness of research evidence in public health decision making. There is anecdotal evidence that staff members who have viewed the completed literature reviews have used the information as supporting evidence in their work. One of the challenges in evaluation is not being able to know empirically how many individuals are viewing other people’s literature reviews, as there is no formal software in place to track online statistics. What can be measured are the projected activities from our communication outline to address barriers. In February 2017, the wiki was presented to approximately 20 nursing students in conjunction with the SLSP librarian. Some successes include: assistance with question development, requests for full-text articles, usage of the templates from the wiki and posted synthesized reviews. Posts to the wiki will be measured annually, with a baseline currently of 12 from June 2016 to December 2016. Completed posts will be reviewed to assess consistency across the organization on how research evidence is being synthesized. A more substantial impact of the wiki was revealed in two key informant interviews with staff who used the wiki to conduct their literature review. They noted the development of their critical thinking skills during this process. They also emphasized the importance of keeping in mind the organizational context (e.g., local demographics, financial resources, political preferences, etc.) and how this might impact their key recommendations after synthesizing the research. This speaks to a more complete understanding of EIDM from the practitioners as well as a cultural shift within the organization. The primary lesson learned is the importance of having a complete communication plan. Staff members at all levels need to be aware of the initiative. Posting the content and hoping that it would spread through word of mouth did not generate enough traffic, despite recognition that it fills a gap in the organization. Attracting key organizational staff such as supervisors and specialists at OPH to support the initiative is essential. These champions can help build staff capacity and incorporate work plans to direct staff to the wiki accordingly. Collaborating with the off-site SLSP librarian on the initiative has also contributed to developing a mechanism to facilitate knowledge exchange. Working together has helped identify gaps and minimize barriers. Since the SLSP librarian is situated off-site, OPH library liaisons are now working collaboratively with the librarian on upcoming workshops for staff. Another key lesson is the need to select a platform that is user friendly, accessible to all staff and encourages staff use with limited training to contribute content. Building on the success of this initiative, a “parent wiki” page is in development. The landing page of the parent wiki is the EIDM model. Included below the model are links to four different wikis, one for each EIDM domain. The parent wiki content will include tips and tools on how to obtain and apply local evidence to decision making in public health, as well as information on the OPH epidemiology team. Determine if community-level perinatal mood disorder programs are effective to prevent perinatal mood disorders. Inform internal and regional level program implementation decisions. Psychological and psychosocial interventions were selected as the focus of the review because these types of interventions align with traditional public health prevention programming. To help the SMDHU librarian develop a search strategy, perinatal mood disorders were defined to include depression and only those anxiety disorders that are amenable to preventive strategies (i.e., generalized anxiety disorder and post-partum stress disorder). In order to align with the scope and purpose of the rapid review, we focused only on one outcome: the diagnosis of a perinatal mood disorder. A search of electronic databases was limited to randomized controlled trials, systematic reviews with or without meta-analysis and guidelines. Results were limited to English language studies published between 2013 and 2016. The primary outcome of interest was diagnosed perinatal depression or anxiety as defined by the study authors. Studies reporting outcomes related to decreasing perinatal depression symptomology or mean differences in depression or anxiety scores were excluded. After initial screening of the titles and abstracts, we decided to focus on systematic reviews and guidelines. After screening and quality assessment, four systematic reviews and two guidelines were retained. One guideline was assessed as being the highest quality source of evidence because of the rigorous methodology and data analysis used. This guideline identified only a few original studies that reported our outcome of diagnosis of depression or anxiety. These studies were rated as low or very low methodological quality. There were no statistically significant differences in the rate of diagnosis of perinatal depression or anxiety for at-risk women receiving any type of psychological or psychosocial intervention compared to receiving no intervention. This finding directly conflicted with the results of one of the included systematic reviews. After careful examination, it was discovered that the guideline and the systematic review used different definitions of prevention and treatment to identify primary studies and used different analytical methods to address missing data. Also, our re-analysis of some of the systematic review data revealed no statistically significant difference in the rate of being diagnosed with perinatal anxiety or depression, in contrast to the conclusions of the systematic review but consistent with the findings of the guideline. Overall, no consistent, high quality evidence was found that demonstrates psychological or psychosocial interventions are effective in preventing the diagnosis of perinatal mood disorders. Specifically, women with established risk factors for postpartum depression or anxiety who attended any form of psychological or psychosocial preventive programs were just as likely to be diagnosed with depression or anxiety compared to women who did not attend these programs. It is not known whether the overall lack of intervention effectiveness was due to small sample sizes, poor methodological quality or an overall limited number of trials reporting on our outcome of interest, or because the interventions were truly ineffective. The effect of psychological or psychosocial preventive programs on women without risk factors for developing a perinatal mood disorder is unknown. Once the rapid review was completed, key decision-makers within SMDHU met to discuss the local community application of the rapid review results using the NCCMT Applicability and Transferability tool. As a result of this process, SMDHU endorsed the findings of the rapid review and will not add any new interventions or programs focusing on preventing the diagnosis of perinatal depression or anxiety to existing services. Local community perinatal mental health coalitions are now considering the findings of the rapid review as intervention plans are developed. Our rapid review report was shared with the Healthy Human Development Table supported through Public Health Ontario and other local groups to inform planning work. Several lessons were learned during the rapid review development process. Prior to reviewing titles and abstracts, a protocol document was developed with support from members of the Child Health Program that provided definitions for the inclusion and exclusion criteria. The six authors of the rapid review team referred to this document frequently when making decisions about study inclusions and exclusions. As this was SMDHU’s first experience with a rapid review, we identified some processes that could be improved upon to help future internal groups conduct a rapid review. For example, it is recommended that future reviews allow for additional time to discuss iterations of the search strategy with a librarian and key members of the rapid review team. It is also recommended that the process used for the rapid review and any key decisions made along the way be included in a draft report. This would facilitate the writing of the report. A key learning was to ensure all team members are clear about how the outcome of interest is defined and measured. This lack of clarity led to the late exclusion of papers that did not meet our inclusion criteria. Finally, it is often easy for busy public health professionals to accept conclusions of systematic reviews authored by experts. However, it is important to critically appraise not just the content, but the authors’ data analysis as well. In doing so, we discovered an error in a Cochrane Review that was later confirmed as erroneous by the author. The Sudbury & District Health Unit (SDHU) is committed to enhancing evidence-informed decision making (EIDM) across the organization and ensuring that all staff members identify EIDM as a priority. This multi-faceted, organization-wide initiative is referenced in the SDHU Strategic Plan and emphasizes that all types of evidence are factored into decisions, including diverse sources beyond research evidence. For example, information about the community context and political preferences are important sources of data that inform decision making. Additionally, the health unit’s EIDM framework emphasizes roles for all members of the organization in EIDM. For instance, public health nurses who work in the community may learn key information about the local context from conversations with community members, or an office assistant may field multiple calls about a health topic and thus become aware of community demands. Staff members therefore have a responsibility to communicate these needs to program planners. The SDHU has made significant progress in gathering and using evidence from both research findings as well as the community by engaging all public health unit staff members. The overall goal of developing an EIDM strategy was to ensure that public health practitioners at SDHU, as well as all levels of staff, have the skills and knowledge required to address emerging public health issues using the best available evidence. A task group of planners and management generated an organization-wide framework that identified the EIDM roles and responsibilities for each category of staff, such as public health nurses and program planners. Skills and capacity building plans were developed to ensure that staff have the knowledge and skills or the training required to be effective in their EIDM roles. Considering a variety of sources of evidence—community health issues, local context, community and political preference and action, research and public health resources—to inform our public health practice is crucial.1 The Evidence-Informed Practice Working Group (EIPWG) was established in 2012 to provide a forum for cross-organizational dialogue about evidence and program planning. The working group plays a key role in coordinating the review, synthesis and translation of the best available evidence to guide and inform program planning. Members of this group meet monthly and include health promoters, epidemiologists, public health nutritionists, foundational standard specialists and a manager. Members belong to different teams and divisions within the health unit and report findings to their teams. Results help inform manager and director program and service decisions. Foundational standard specialists play an important role in fostering the development of and uptake of organization-wide evidence-informed processes, tools and structures. These individuals are experienced in EIDM processes and have the skills to guide members of the EIPWG. Foundational standard specialists work in research, evaluation and planning across all programs. The specialists work closely with program planners (e.g., health promoters and public health nutritionists), who play a key role in terms of evidence collection at the team and division levels. The executive committee members play a leadership role in championing EIDM processes and structures and supporting effective implementation across the organization. Program managers oversee the planning process and use the best available evidence to inform what the organization should be doing, such as stopping, starting, adapting or re-aligning a program or service. Program and front-line staff play an important role in gathering evidence in their daily work and bringing it forward to planners and managers. They contribute by observing and sharing their knowledge of program processes, community context and preference. These staff members were identified as having a valuable insight into what is working well and what could be done better. In order to support all staff in meeting expectations for these roles and responsibilities, a multi-year staff capacity development plan was created. This included building capacity to gather evidence from multiple sources, such as community health issues and local context, existing public health resources, community and political climate, and the best available research evidence. Several Evidence-Informed Public Health Practice Primers were developed to orient new and existing staff. These primers outline staff roles and expectations, as well as provide guidance to how evidence-informed practice can be done. To engage staff, the primers were released in conjunction with a video montage of interviews with staff about EIDM. To ensure that staff continue to access the primers and fulfill their EIDM roles, prompts have been incorporated into various staff processes. For example, discussion of community context and needs is a standing item on the agenda for team meetings. Prompts have also been added to different tools and forms that staff use in their daily work. Messaging to all staff at the SDHU emphasizes that we all have a role to play in gathering and reporting evidence. Program planners, in collaboration with managers, are responsible for translating that evidence into decisions. Explicitly designate EIDM as a strategic, long-term, organization-level priority. Ensure strong, visible, committed and stable leadership. Identify, develop and diffuse EIDM champions across the organization and across roles. Make significant and long-term fiscal investments in EIDM. Develop an education/training strategy for all staff that responds to their role-specific needs for EIDM knowledge/skills. Build the capacity for library/information services reviews and address barriers to accessing databases and full-text articles. Provide opportunities for meaningful and productive staff linkage and exchange regarding EIDM. Take purposeful steps to build EIDM capacity but maintain a flexible approach to change. The changing landscape in the study of hepatitis C toward more effective and better tolerated treatments has led to increased integration of hepatitis C care within primary care settings.5 While best practice resources exist for family physicians, resources tailored to primary care registered nurses providing care to clients with hepatitis C are lacking. This project was developed through a student–preceptor collaboration to address this gap in resources and improve comprehensive care. Explore the educational needs of nurses in providing care to clients with hepatitis C throughout their illness and post cure care. Develop a best practice resource tool as a reference for primary care nurses in consultation with members of the hepatitis C medical team, primary care nurses, community support works and people with lived experience of hepatitis and hepatitis C treatment team at Toronto Community Hepatitis C Program. Disseminate this resource to primary care nursing community beginning with community health centres involved in The Toronto Community Hepatitis C Program (TCHCP) and potentially spreading to professional nursing networks, associations and conferences. The TCHCP, a community-based model of care, seeks to provide hepatitis C treatment to underserved populations through a multidisciplinary team approach. The TCHCP seeks to provide low barrier care through a partnership between three community-based health centres. Comprehensive services are provided through collaboration with nurses, nurse practitioners, family physicians, counsellors, a team of support staff and infectious disease consultation. In response to a request for training about hepatitis C relevant to primary care by the nursing team at one of the TCHCP community health centres, a gap in nursing-specific hepatitis C resources was identified. In response to this request, we conducted a review of the literature, a PubMed database search for research within primary nursing care for patients with hepatitis C in Canada, to determine what literature, guidelines and resources were already published. This research made it clear that while there are resources for nurses caring for patients with hepatitis C, there is a gap in Canadian nursing resources. In addition to fulfilling the initial request for nursing education, this initiative sought to advocate for improved client care and fulfill the mandate of nursing advisory bodies. The Registered Nurses Association of Ontario encourages primary care nurses to provide comprehensive care to clients through an expanded scope of practice facilitated by ongoing education. A best practice resource tool supports this level of care and allows primary care RNs to participate in hepatitis C care reaching clients during their primary care interactions. We believe this can increase screening and identifying people with hepatitis C, foster connection to treatment, holistically support clients after treatment and increase awareness about hepatitis C transmission to prevent new and reinfections. Upon recognizing that we would be creating a best practice resource tool, we used the Institute for Health Care Improvement’s PDSA Worksheet for Testing Change as a framework to guide development. Feedback from primary care nurses identified a lack of knowledge of hepatitis C. Of particular importance to nurses surveyed was a document that would provide guidance in screening criteria and methods of testing for hepatitis C, an overview of the current treatment landscape, guidance about vaccines and preventive care, and education with regard to liver health. Additionally, we included information on needs of clients post treatment, the social stigma of hepatitis C, naloxone for use with opioid overdose and the impact of the social determinants of health on clients’ ability to access care. The nurses surveyed felt that this tool could be helpful as a quick reference document for use while in client appointments, and suggested including links to more in-depth information if desired. Currently in the Study stage, the tool was presented to six primary care RNs through a one-hour education session. Feedback was solicited during the session regarding content, ease of use and feasibility for use in practice. Additionally, the tool was forwarded to primary care nurses via email and feedback was requested. The next step is to circulate the tool among TCHCP’s interprofessional team including pharmacists, partnership hepatitis C treatment nurses, MDs and infectious disease specialists, outreach workers and our Patient Advisory Board. This feedback will be analyzed and revisions will be made to the tool during the Act phase. Quality improvement initiatives can be identified by students and implemented using a student–preceptor initiative. Creating a best practice resource tool with stakeholder consultation is beyond the scope of one university semester. For this quality improvement project, the student and preceptor continue to work on development, implementation and dissemination of information. We have identified that it is challenging to maintain the project’s momentum when the student and preceptor no longer have the time and ongoing contact facilitated by a clinical placement. It was beneficial to have a project to work on throughout the placement to feel accountable and responsible for one aspect of the program. From a student perspective, it can be intimidating to present a best practice guideline to a group of experienced nurses, however the supportive nature of the nurses working at the health centre provided the confidence needed to create such a guideline. 1ASHM. (2016). Primary Care Providers and Hepatitis C. The Australian Government, Department of Health. 4Von Aesch, Z., Steele, L.S. & Shah, H. (2016). Primary care flow sheet for hepatitis C virus: tool for improved monitoring. Canadian Family Physician, 62, 384-392. 5Meyers, R.P., Shah, H., Burak, K.W., Cooper, C. & Feld, J.J. (2015). An update on the management of chronic hepatitis C: 2015 Consensus guidelines from the Canadian Association for the Study of the Liver. Can J Gastroenterol Hepatol, 29(1). 6Pinette, G.D., Cox, J.J., Heathcote, J., Moore, L., Adamowski, K. & Riehl G. (2009). Primary Care Management of Chronic Hepatitis C: A professional desk reference 2009. Public Health Agency of Canada (PHAC). 7Ha, S., Totten, S., Pogany, L., Wu, J. & Gale-Rowe, M. (2016). Hepatitis C in Canada and the importance of risk-based screening. Can Comm Dis Rep, 42, 57-62. 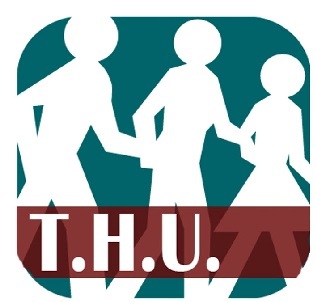 The Timiskaming Health Unit (THU) is a local public health agency in Northern Ontario that works to promote and protect the health of Timiskaming residents. 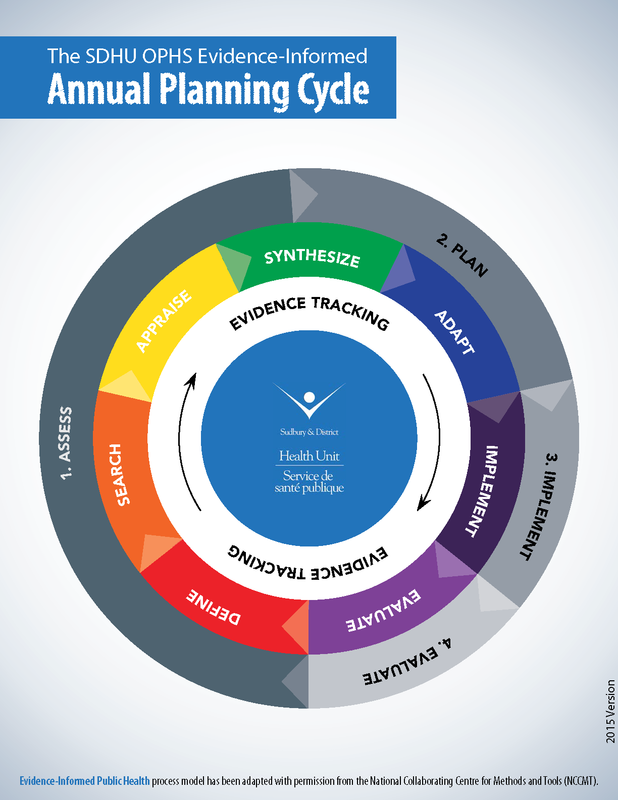 THU’s program cycle includes planning, implementation and evaluation of public health interventions. Tools are available to support teams in the program cycle; however, there often is varied interpretation and application of the tools, resulting in difficulty capturing the information necessary to set priorities. Situational assessments are a valuable source of evidence and were identified as the target for the evidence-informed decision making (EIDM) practice change presented here. It was hypothesized that changing the situational assessment process and tool would reduce inconsistencies in interpreting and using the situational assessment in program planning. Improve the timely completion of situational assessments. Improve the quality of information included in situational assessments. Improve efficiencies in the program cycle. Capitalize on gained efficiencies to increase capacity to use quality evidence in subsequent steps in the program cycle. Increase capacity to set local priorities that reflect the best available evidence. In 2016, THU’s Chronic Disease and Injury Prevention team piloted a change to the process and tool used to complete situational assessments. The situational assessment tool includes prompting questions to incorporate the best available information from various sources, including surveillance data; research literature; local, provincial and national stakeholders; and political, social and economic environments. The tool also prompts the author to consider gaps in information, social determinants of the public health topic and any health equity issues or priority populations. Previously, each topic lead (one of between eight and ten front-line staff) led their own planning with support from the epidemiologist and the program evaluator. However, despite support for dedicating time to the task, staff struggled with interpretation and use of the situational assessment tool. It was also noted that the quality and type of information in situational assessments varied, which led to difficulty using the information collected to inform decision making. improve the utility of the tool in eliciting the information needed to best determine local public health priorities and inform decision making. The working group also consulted with the program evaluator, who provided feedback and advice. The group then validated its recommended changes and sought feedback from the entire Chronic Disease and Injury Prevention team. The working group incorporated the team’s feedback and finalized revisions to the tool. In terms of process change, two RPPAs were assigned to lead the completion of situational assessments for each topic area of the Chronic Disease and Injury Prevention program. This change helped to manage the varied knowledge and expertise of topic leads, and helped to reduce inefficiencies and better meet timelines within the program cycle. The RPPAs led the search for and analysis of data on health outcomes, behaviours and determinants, and topic leads contributed local context, arising issues related to the topic and stakeholders’ initiatives, perspectives and priorities. Together, the RPPA and topic lead critically appraised the information being included in the situational assessment and identified gaps and needs related to the topic. Initially, the proposed process change did result in some concerns for staff. Throughout the cycle, the program manager and RPPAs informally checked in on the process and addressed concerns. As the process continued to be implemented, positive feedback on the changes was received. After one year-long program cycle, a debrief session was held to discuss the use of the revised tool and process. Based on the debrief session, we found that overall, the changes helped ensure consistency and rigour in situational assessments across topics. Additionally, the new process allowed for the systematic identification of local needs relating to each topic, which can then inform priority setting and identification of research questions. There was also a sense that the new tool and process helped to minimize inefficiencies and duplication of work and improved the ability to meet timelines. The debrief session also created discussion around areas for continued improvement. For example, it was noted that the process of engaging with stakeholders and systematically collecting information about their priorities could still be improved upon. Findings such as these highlight the importance of monitoring the process of EIDM changes in addition to the outcomes. The debrief session was attended by the managers and research, planning and policy analysts (RPPAs) of the other teams within the health unit, in addition to those from Chronic Disease and Injury Prevention program. This facilitated discussion around rolling out the changes to other teams within the agency. Following the debrief session, the tool was finalized and its use will be expanded to the other teams within the THU. For those topics that were part of the pilot, additional capacity is now available to improve the rigour of the subsequent steps in the program cycle, which was one of the long-term goals of this EIDM change. Always keep the purpose and end-users in mind when adopting, adapting or creating tools. Balance standardization of tools with flexibility and adaptability. Monitor process in addition to outcomes of an EIDM change, which could lead to richer findings. Those interested in receiving a copy of THU’s situational assessment tool or in learning more are invited to contact the author. Research has shown that antibiotics are overprescribed in long-term care homes (LTCH), which contributes to adverse outcomes such as Clostridium difficile infections and antimicrobial resistance (AMR). AMR is emerging as a pressing global health issue, with the World Health Organization and United Nations recently calling for global action. Although a global issue, AMR must be tackled at a local level. In LTCHs, a key contributor to the overuse of antibiotics is the practice of prescribing antimicrobials for asymptomatic bacteriuria (ASB). ASB is the presence of bacteria in the urine (a positive urine culture) without the signs and symptoms of a urinary tract infection (UTI). Antibiotics are not required in the treatment of ASB. As the majority of individuals in long-term care will have a positive urine culture even if asymptomatic, a positive culture does not necessarily constitute an infection. In cases of ASB, clinicians find it difficult not to treat a positive urine culture, despite the resident not fitting defined criteria for a UTI. As a result, residents are given unnecessary antibiotics. One solution to this problem is to reduce the number of unnecessary urine cultures that are collected and tested in LTCHs. If urine cultures are only sent when clinically indicated (i.e., residents have signs and symptoms of a UTI), then fewer urine cultures will be sent, and fewer prescriptions will be given for ASB. This requires a change in practices from a variety of LTCH staff—from when and how urine is collected to prescribing decisions. In order to address the barriers associated with changing practices and shifting workplace cultures, different strategies are required at a variety of levels, including staff, family, resident and organizational levels. 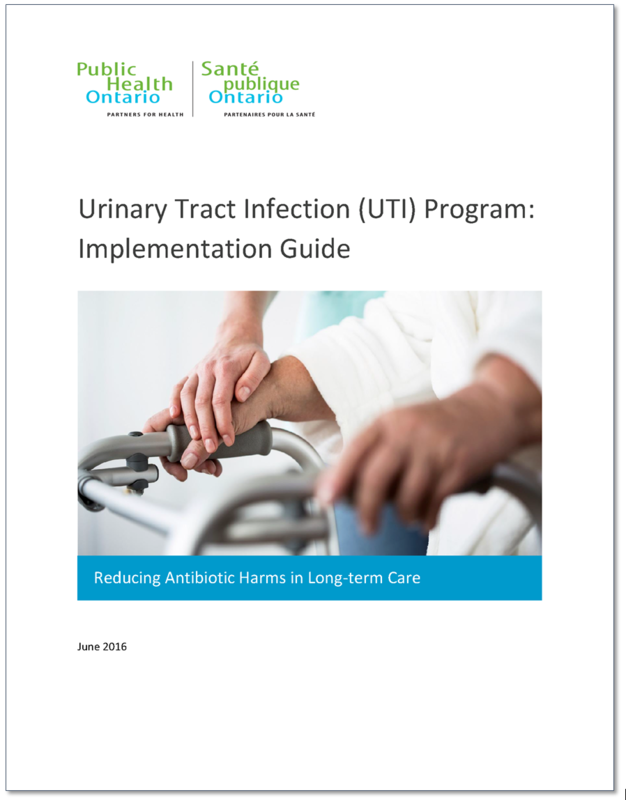 The Urinary Tract Infection Program developed by Public Health Ontario (PHO) is an evidence-informed decision making (EIDM) change initiative, aimed at reducing antibiotic-related harms in LTCH residents in Ontario. It was developed in response to a survey consultation with Ontario LTCHs in 2012 in which practitioners identified a knowledge-to-practice gap for testing for and treating UTIs. To address this gap, PHO developed the UTI Program, which is currently undergoing a pilot evaluation in twelve LTCHs in Ontario. The approach taken by PHO with this initiative was a novel one for the organization. PHO’s 2014–19 strategic plan identified implementation science (IS) as one of the organization’s key strategic directions. It was proposed that a UTI project be initiated with the intent to explore the ways in which IS could be used in program development, implementation and evaluation. The project team used key IS theories and frameworks, including the Knowledge-to-Action Cycle, Capability-Opportunity-Motivation-Behaviour (COM-B) Model and the Theoretical Domains Framework (TDF) to develop an “evidence-informed, theory-driven” program to develop best practices for identifying and prescribing antimicrobials for UTIs in LTCHs. One of the critical goals in developing the program was to address the underlying reasons that prevent, or enable, individuals when they are adopting a change in practice or behaviour. From there, the most appropriate strategies for targeting those specific reasons are developed, with the goal of changing current practices toward ideal practices. This use of IS to understand the problem and to design the intervention was a “new way of work” for the organization. First, the UTI project team analyzed the results of the survey mentioned earlier, which was administered to Ontario LTCHs with input from staff holding a range of administrative and clinical roles in the facility. Drawing on existing guidelines, the project team defined five evidence-based practices to focus on based on the practice gaps identified in the survey. Next, barriers to these practice changes were analyzed and subsequently mapped to implementation strategies that are known to target and support the underlying reasons for individuals to change (or not change) their behaviour. Examples of these strategies include providing educational materials, identifying champions, integrating surveillance into practice, and educating residents and families. Additional key program components included forming an implementation team with essential staff at each LTCH, undergoing readiness assessments for practice change, and assigning roles and responsibilities. 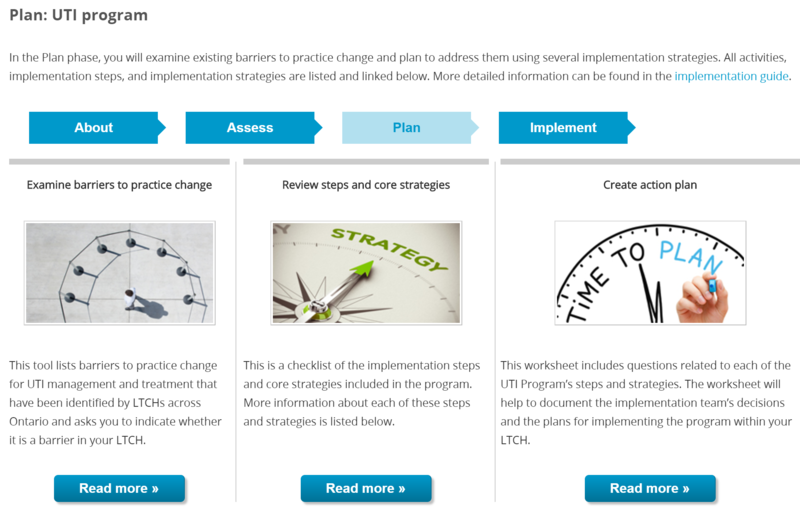 All of these steps are outlined in an implementation guide that LTCHs can use to start the program, along with online tools and resources to support implementation at each home. In 2015, the UTI program underwent a Phase I pilot (formative evaluation) with two LTCHs in Ontario. Observations from the pilot were summarized with 64 recommendations to enhance the program resources, overall program design and support for implementation. Changes were made to the program resources and additional recommendations were incorporated into an implementation guide. As of early 2017, the project is undergoing the Phase II pilot with 12 LTCHs across the province to evaluate the impact of, and processes associated with, the program. Quantitative data are being collected to measure trends in urine culture collection and antibiotic prescription rates, and will be analyzed for significant changes between pre- and post-implementation. Additional data, including documentation and key informant interviews with LTCH staff, will be collected to assess the implementation process at each site and the experiences of implementation teams and staff involved in the practice change initiatives. Key findings will be reviewed and incorporated into the program—structure, processes and resources—prior to offering the program at a provincial level. PHO will bring together a group of staff and consult with stakeholders in the field as it plans to scale up this initiative provincially. A steering committee will be tasked with making changes to the program along with mapping out the best and most appropriate ways to implement this initiative in LTCHs across Ontario. At the end of its development, PHO’s goal is to have an evidence-informed, theory-driven program that shows promise and results in reducing antimicrobial use and antimicrobial harms in LTCHs. For more information about the UTI program, visit www.publichealthontario.ca/UTI. Compared to healthy adults, seniors in long-term care are more susceptible to the harmful effects of carbon monoxide (CO) because they may have diminished physical health, spend a substantial amount of time indoors and have limited ability to protect themselves from CO exposures. Preventing adverse health impacts among vulnerable populations in long-term care requires additional precautions to adequately monitor and respond to CO beyond the installation of CO detectors. In 2016, Interior Health (IH) implemented and evaluated a pilot project to identify, monitor and respond to elevated indoor CO in six long-term care facilities (LTCFs) in the BC Interior. This work supports IH’s key strategy to improve primary and community care outcomes for frail seniors living with complex chronic conditions. LTCF residents are vulnerable to health effects of low-level CO exposures given their compromised health status and substantial time spent indoors (~150,000 residents lived in >1500 LTCFs across Canada in 2013). Existing CO detectors do not adequately protect LTCF residents from low-level CO.
Health authorities and LTCFs have unrecognized threats from CO risks and limited capacity to detect and respond to CO exposures. Evidence-based strategies to mitigate CO risks in LTCFs are lacking. Due to the lack of evidence for strategies related to this issue, the pilot was based primarily on experiential and practice-based knowledge, with technical aspects based on scientific evidence. First, a review was conducted to assess health effects related to acute, sub-acute and chronic CO exposures in healthy and vulnerable populations. Then, an expert consultation meeting was convened to discuss considerations for advancing the development of a health-protective CO monitoring framework for LTCFs. In 2015, an evaluation of Saskatoon Health Region’s policy and their program provided further insight into practical considerations for a CO monitoring and response policy. It included a comprehensive examination of the policy; interviews with administrators, policy owners, managers and staff; site visits/tours of facilities and site audits; and analysis of monitoring and reporting data. Establish a CO monitoring and response framework in six LTCFs. Reduce the risk of harmful CO exposure among residents and staff. Identify facilitators and barriers to implementation. Inform on feasibility and applicability of the framework in IH and other health authorities across Canada. The pilot included a number of components: education, monitoring, prevention and mitigation. This involved educating LTCF staff on CO sources and health effects, installing CO detectors, as well as developing protocols for monitoring and responding to elevated CO levels. The resulting framework provided a method to ensure indoor CO is below Health Canada’s maximum exposure limit of 10 ppm over 24 hours. The pilot is part of a collaborative project involving the National Collaborating Centre for Environmental Health (NCCEH), BC Centre for Disease Control (BCCDC), Saskatoon Health Region and Health Canada. Together, their work provides an evidence base for addressing the under-recognized threat of CO to residents in LTCFs. Evidence for the pilot was sourced from issues identified in the initial Saskatchewan CO exposure incident, expert consultation and review of guidelines, as well as the findings and experience from an evaluation of the CO monitoring policies in several LTCFs in Saskatchewan. Tools were later developed to increase the capacity for health agencies, like IH, to implement a CO Monitoring and Response Framework in LTCFs. To guide the implementation of the pilot, an IH CO Internal Working Group was established comprised of individuals from IH Health Protection, Plant Services, Residential Services, Occupational Hygiene, Support Services and the NCCEH. The CO Working Group developed and used a document detailing the components, stakeholder roles and responsibilities, and procedures. Protocols were integrated into existing maintenance and emergency response structures, where monitoring and response actions increase the detection of potential CO issues so they can be addressed before adverse health impacts arise. The pilot has also undergone an evaluation. The pilot was evaluated using an evaluation team consisting of an external credentialed evaluator and the NCCEH. An Evaluation Advisory Group, consisting of several individuals from the CO Working Group, developed an evaluation framework by adapting previous work done to evaluate CO monitoring in Saskatoon Health Region. The evaluation period covered up to 6 months after implementation and consisted of document review, interviews with staff and supervisors, analysis of monitoring data and direct site audits. The intended results were achieved in terms of understanding the challenges and facilitators to implementation and utility in capturing elevated CO levels. Recommendations were made for the Evaluation Advisory Group and IH leadership to determine the next steps for the initiative, given the evidence provided through the work done to date. This case example is a successful illustration of how health agencies can address cross-cutting environmental health issues in Canada by sharing experiences, collaborating with partners and adapting innovative practices for evidence-informed decision making. Under-recognized threats such as CO in LTCFs would not have been identified without effective use of partnerships between local, provincial and federal agencies. Practitioners should be flexible in using program/policy planning and evaluation concepts to inform decisions when assessing innovative practices.